Year after year, the Hyundai Accent continues to prove that good things do indeed come in small packages. Boasting a number of distinctive interior features, the Hyundai Accent is one of the nation's most popular subcompact sedans. 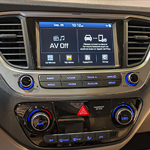 The friendly associates at Billingsley Hyundai of Lawton are well-equipped to demonstrate to you all of the unique interior features of this fun and sporty vehicle. The value-driven Accent features an abundant amount of standard interior features such as the utilitarian rearview camera, Bluetooth connectivity, a USB port, and a generous four-speaker audio system complete with a 5-inch touch screen. All of these features combine to make your ride more comfortable, connected, and convenient. A host of additional available features allow you to customize your Accent to fit your personal needs and preferences. Drivers can choose from options such as forward collision warning, power sunroof, automatic emergency braking, voice recognition capabilities, satellite radio, and much more.